And then, once again, there were none. 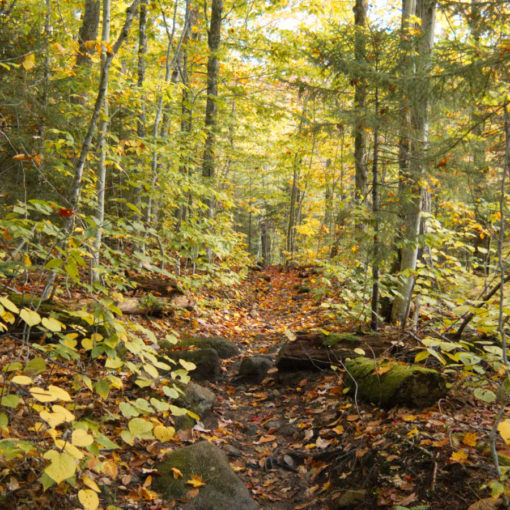 Via Hunt Trail, Baxter Cutoff Trail, Saddle Trail, Northwest Basin Trail, Hamlin Ridge Trail. 65 dF +/- at the trailhead, 55 at the summit. Cloudy. Wind at Hamlin summit was 20, gusting to 30 MPH. Baxter summit was approx. 50 MPH, gusting to 60. Visibility at Baxter had closed down to approx 50 yards. Light rain at approx 1600. Trailhead: 0900; Hamlin Summit: 1320; Baxter Summit: 1430; back at car: 1700. Most certainly Type II fun. But wow, fun. When I started out to hike the 48, Katahdin wasn’t even on the radar, obviously. 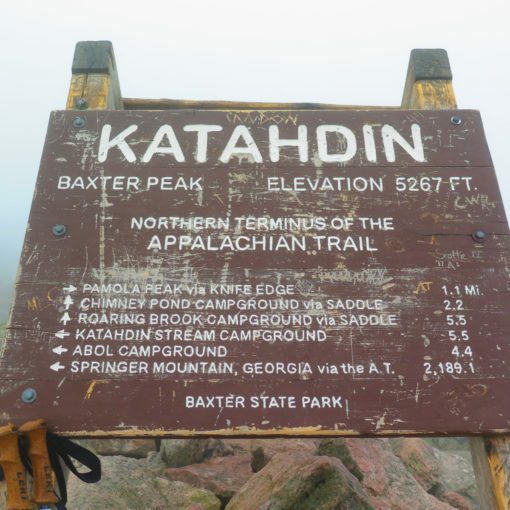 There came a time (this was around halfway through the list) I started to become viscerally aware of the AT, and it was probably at this point where Katahdin came into the picture. When I finished the 48 and decided to keep going on the 67, it turned into a fait accompli. I’d have to hike it. And so I did. I wish I could say it was everything I hoped for. But that falls short, because it delivered a lot that I couldn’t have ever dreamed to hope for. I’ll cut to the short: it’s a magnificent hike on a magnificent mountain. It’s also the hardest I’ve done, bar none. Whether or not you’re doing the 67 (or any other list) just stop what you’re doing and hike this beast. You can thank me later. No matter how I tried to approach it, Vermont never sat well with me. I won’t say this is a permanent condition. I’ll be finishing off the Hundred Highest list before long (likely next year) and so will be spending a bit more time in the Green Mountain State. Maybe I’ll come to peace with it. Here’s hoping that happens. Maine, on the other hand, got its meathooks into me very early on. Indeed, probably with its first peak — I remember standing on Old Speck’s observation tower, gazing over the wilderness in awe. 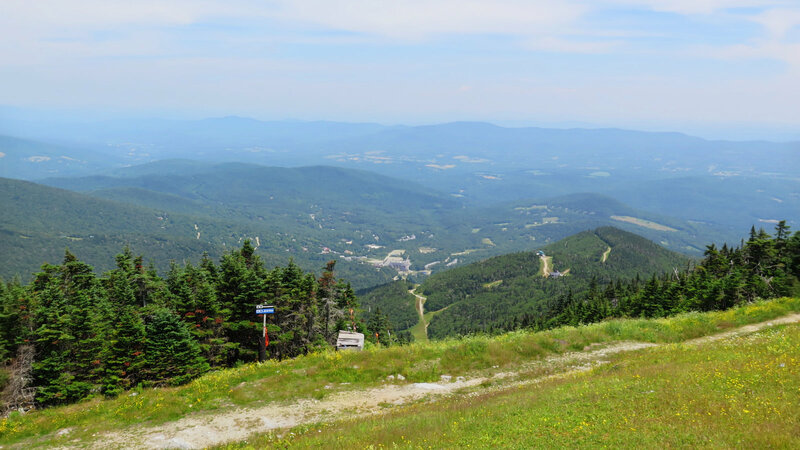 When I finished the mountains in the Carrabassett Valley, a wave of both happiness and melancholy swept over me, because while I had almost the entire list behind me, it was time to move on to Baxter State Park. Katahdin is obviously still in Maine, but I had made friends with those mountains to the southwest. In astonishingly short order, that valley had become home. Color me utterly gobsmacked at how deeply that happened. So it was with no small sense of all of this that I set out for my last three peaks. North Brother was done relatively quickly. (Even though I missed out on bagging its three neighbors.) And then, all that lay before me was Hamlin and Baxter peaks. 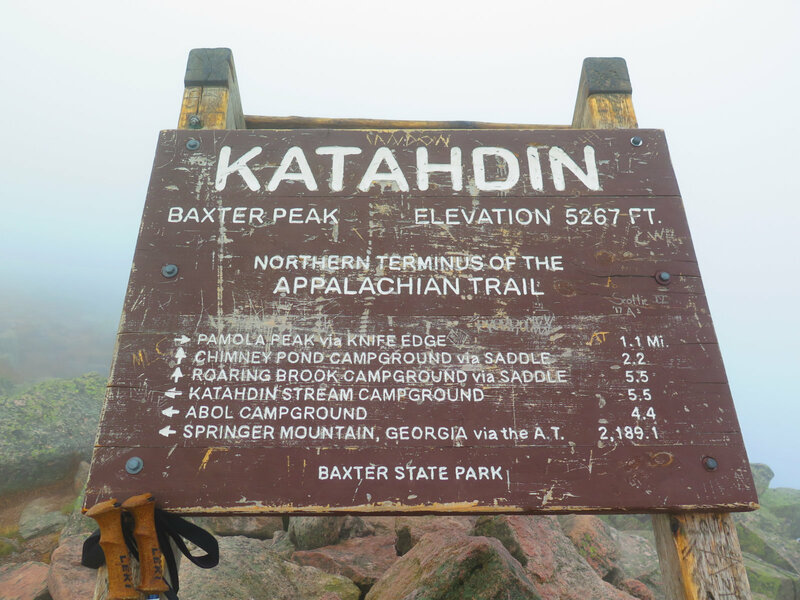 When one thinks of Katahdin, one really thinks of Baxter, the northern terminus of the AT. I left the house in the crazy wee-hours of the morning. Driving north, I noted the change in the scenery. Passing through long miles of flat, viewless terrain, I gained a sense of just how isolated I was. There are “towns” north of Bangor that aren’t even named — they just have alpha-numeric designators. After awhile, I got to Medway, and then turned toward Millinocket. North Brother the week before really whet my appetite, so coming into town, my excitement was palpable. I got to the trailhead, and it wasn’t unlike many others that I’d seen. I signed the register and got going. Heading down the trail, it was a fantastic autumn day to be out. Everything was moist and verdant, looking magical with the autumn leaves beginning to turn. I ascended, and crossed a wooden bridge by a small waterfall, and then passed Katahdin Stream Falls a short bit off the side of the trail. Wow, that waterfall was a postcard. Above treeline, things got decidedly hairy. It’s very rocky, and there were some installations of “monkey bars” in a few places, because the going would be really treacherous otherwise. (As it was, the trail was still very technical.) More than a few times, I reflected on what falling would mean, and those thoughts encouraged me to be exceptionally careful. It’s not as exposed or as crazy as the Knife Edge on the other side of the mountain, but it’s still hard climbing. I emerged to find the Tableland. Wow. It’s a huge expanse, effectively a wide-open plain on top of a massif. Everywhere were boulders strewn about (likely by the glacier that carved Katahdin) with vegetation finding its place in the spaces in between. I wish I’d been there in the summer, because I can only imagine this area exploding with life. Passing Thoreau Spring, I took the Baxter Cutoff Trail to the Saddle Trail, then continued on the Northwest Basin Trail. A short bit on the Hamlin Ridge trail brought me to my first goal. 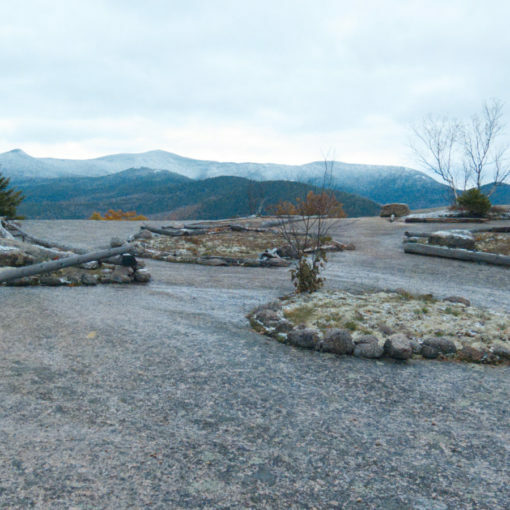 Hamlin Peak isn’t much more than a featureless bump on a long, slow arc of a mountain top. I wish the clouds weren’t in abundance, because I got the sense that the view was the redeeming quality, because there’s nothing to get in the way of an all-encompassing panorama. Having that peak (finally) under my belt, I turned to my final objective. Oh yeah: I didn’t mention the wind. Or the fog. There’s no such thing as a free lunch. This was definitely Type II fun. In the trees, as has consistently been the case, wind hasn’t ever been a factor in much of anything. But above treeline, I measured a near-constant 30 MPH wind, and if anything, it had increased to about 40 MPH when I summited Hamlin. Also in the trees, blazes are everywhere, and the trail is easy to see. Above treeline, the clouds had descended to the point where seeing the second cairn in front of me wasn’t a given. A huge question in my mind, leaving Hamlin, was whether to continue on to Baxter, or come back another day. Knowing I didn’t have to decide until Baxter Cutoff, I dutifully kicked that can down the road a bit. But by Baxter Cutoff, I was beginning to really lean into the wind, and the visibility wasn’t more than about 25 yards or so. Was it worth it? I knew Baxter was half a mile ahead. I also knew the delta between the two trails wasn’t much — maybe ten minutes or so. I’d been watching the time, and although my turnaround time was at hand, I also knew that my pace wasn’t really suffering from the wind — it was really hitting me from the side more than anything. It was relatively warm. My only foe was gravity and the rocky footing. Without the wind, this would be yet another hike. I decided to go for it. To be true, the trail wasn’t smooth sailing, however, it wasn’t worse than any other rocky trail I’d experienced. Adams, Mt Guyot, Abraham… it was on par with any of them. Indeed, in places, there were stone stairs, and that helped a lot. And then, up ahead… a familiar triangular signboard. At long last, I’d made it. 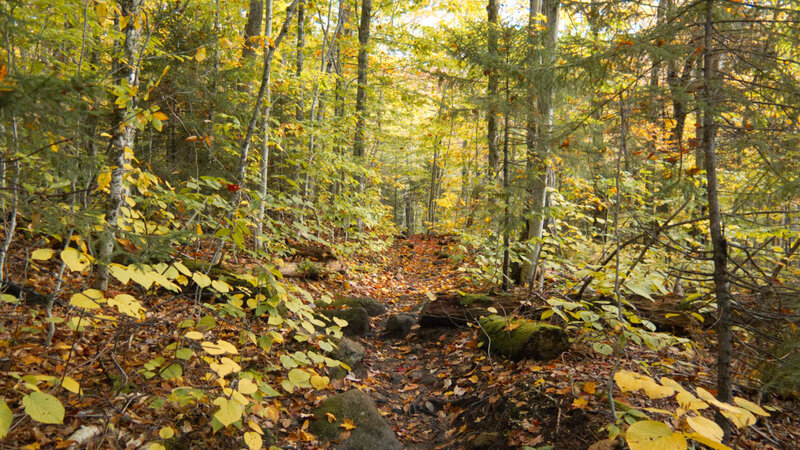 Baxter State Park lays it out: your destination is your safe return to the trailhead. By their rule, I’d only made it halfway. That hairy section with the monkey bars was still in front of me. But not far down from the summit, I spied a couple hikers. I quickly caught up with them and it turned out they’d just finished their hikes — one from Harper’s Ferry, the other from Springer. We exchanged pleasantries, and I offered them a ride from the trailhead into town, which sealed it: we became fast friends, making the miles in front of us melt away. Passing through that hairy bit was so much nicer when done in the company of wonderful people. We made our way down distracting each other with delightful conversation. It didn’t feel like a long time before we were back at the trailhead, safe and sound. You meet the nicest people on the trail. 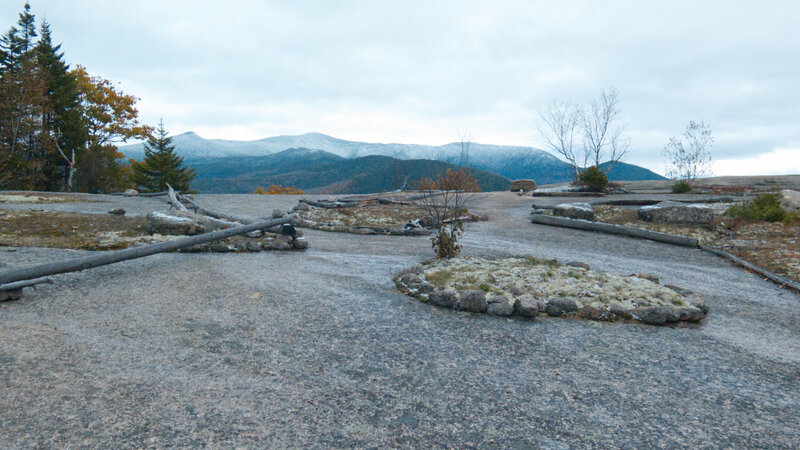 Katahdin is entirely doable as a day trip, even if you’re half a dozen hours away. (Case in point, I finally got home 22 hours after I walked out my front door.) So if your scheduling needs preclude an overnight at the park, remain undaunted. It’s a ton of driving, and your logistics have to be spot-on, but the mountain is totally worth it. Don’t forget to top off your tank before entering the park: Last fuel stop is in Millinocket. The gate is about 20 miles outside of town, and the trailheads are 5-10 miles after that, if you’re going to the stuff “nearby”. Baxter is huge. The walk back will be long if you run out of gas. Entering Baxter State Park, you’ll come to the gate, and a ranger will ask where you’re going, how well you’re equipped, and so on. They also ask for an emergency contact, so have one handy. You’re given a chit that you leave on the dash, and they want that back at the end of the day, so they know who to come looking for. Know that BSP is very isolated. Cell coverage isn’t a given at all. If that’s your escape plan, it’s not a very good one. Also, Katahdin has weather. It’s probably not as legendary as that on Washington, but go ahead and expect it’s going to be as tough. The park is almost above the 46th parallel, so it’s not like it’s in Palm Beach, Florida. Come loaded for bear. The ranger asked if I had traction devices (crampons, spikes, what-have-you) because if the nightly temps dip below freezing, that kind of thing can last well into the daytime. Plan for the worst, and if you get the best, that’s some mighty fine gravy. If time isn’t on your side (budget half an hour from Millinocket to the park gate, and another 15-20-ish minutes from there to the trailhead). Baxter State Park is huge — you can easily drive 40 miles from the south gate to the north, so let that influence your thinking. There’s a lot to see there, so if you’re not going to realistically bag something big, know that there’s a lot of smaller stuff to do in the park that’s just as worthwhile, and anything there will save your trip. Baxter was no dummy: he knew that land was special. Don’t lose sight of that fact. There are a lot of hidden gems to be found. That mountain has existed for more than 10,000 years. It’ll be there for a few more. I promise.